Polio Hits Equatorial Guinea, Threatens Central Africa : Shots - Health News The two cases are the first in the country since 1999. The virus spread from neighboring Cameroon. When polio is on the move in Central Africa, the toll can be tragic. A child receives a polio vaccine Sunday in Kano, Nigeria. The country is the primary source of the virus in Africa but appears to be making progress against the disease; the current outbreak in Cameroon that has spread to Equatorial Guinea came by way of Chad, not Nigeria. After being free of polio for nearly 15 years, Equatorial Guinea has reported two cases of the disease. The children paralyzed are in two distant parts of the country. So the virus may have spread widely across the small nation. The outbreak is dangerous, in part, because Equatorial Guinea has the worst polio vaccination rate in the world: 39 percent. Even Somalia, teetering on the brink of anarchy, vaccinates 47 percent of its children. The World Health Organization encourages countries to keep polio vaccination rates above 80 percent. Most nations' rates are above 95 percent. The Equatorial Guinea outbreak can be traced to neighboring Cameroon, where seven children have been paralyzed by polio since October. "This is actually an outbreak from Cameroon that has been ongoing and has spread," says Oliver Rosenbauer, a spokesman for the WHO's polio eradication initiative in Geneva. Efforts to contain the Cameroon outbreak, he says, have fallen flat. Controlling the disease in Equatorial Guinea will also be challenging. One of the current polio cases is in the capital, Malabo, located on an island off the country's Atlantic coast. The other is more than 100 miles away on the mainland, adjacent to Cameroon. The disease could spread even further, to the troubled Central African Republic. The country has been rocked by violent clashes between Christians and Muslims. And hundreds of thousands of people have been displaced from their homes. Polio thrives in areas with this type of social unrest. Last week the United Nations approved sending 12,000 peacekeepers to the country to try to stem violence. Nigeria remains the only country in Africa where new cases of polio have been reported continuously over the past century. It's also the primary reservoir of the virus on the continent. But this year Nigeria appears to be making progress against polio, Rosenbauer says. Only one case has been recorded in 2014 in the country. And the strain of the virus flourishing in Cameroon came by way of Chad rather than Nigeria. "We are actually concerned that [the] virus is going to spread from Cameroon back into Nigeria, and that you're going to see an outbreak in a polio-free area of Nigeria," Rosenbauer says. 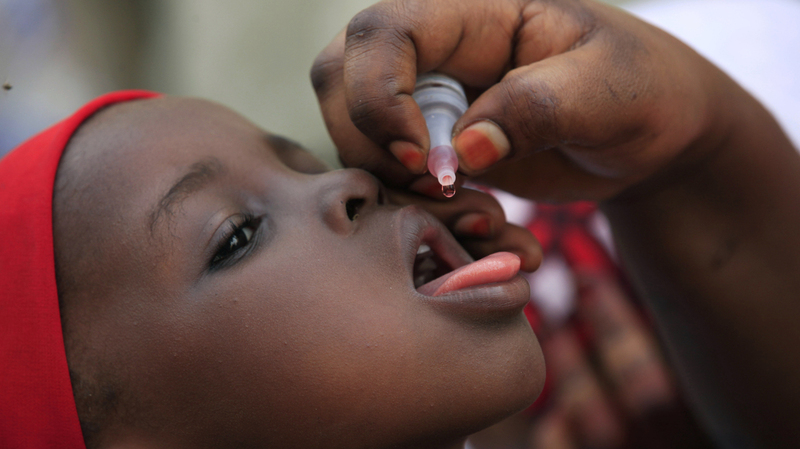 When polio is on the move in Africa, the toll is tragic. A deadly outbreak that hit the region in late 2010 sickened more than 500 people in Congo Brazzaville and Gabon. Many of the victims were adults, and 190 of them died.